The MBA/MA in Government combines the resources of two respected schools within Johns Hopkins—the Carey Business School and the Zanvyl Krieger School of Arts and Sciences—to develop leaders capable of redefining the relationship between business and government. At the junction of political power and business innovation. The distinctive Johns Hopkins Master of Business Administration/Master of Arts in Government responds to the needs of students who envision careers blending business and public-sector expertise. The rigorous course work, encompassing government, politics, ethics, global economics, financial theory, and management, bridges the traditional separation of private and public sectors. Students in the program also have the option of choosing a concentration in homeland security, political communication, or law and justice. Students may complete their MBA courses at Carey’s campus in Baltimore, Washington, D.C., or online. Three online courses (Business Communications, Leadership in Organizations, and Negotiation) require a mandatory residency component at the Baltimore campus. Residences are offered several times throughout the year and range between one and half and two and a half days. Students who pursue the dual MBA/MA degree will take classes in the MA in Government program at the School of Arts and Sciences and in the MBA program at the Carey Business School. Thirty courses are required to complete the degree. Writing a thesis is optional for MBA/MA students, but is encouraged. MBA/MA students who successfully defend their theses will be awarded honors at graduation. MBA/MA students must complete symposia. Detailed information about this requirement can be found on the symposia webpage. Please read through this information carefully. Students who would like to earn a concentration may take four electives in a given concentration area. Concentrations are offered in Political Communication, Security Studies, and Legal Studies. To earn a concentration, students must take four classes in that subject area. View detailed MA in Government degree requirements here. Applications for the MBA/MA in Government dual degree program must be submitted to the Krieger School of Arts and Sciences. The admissions committees of both schools will review each application. For more information, visit the program website, call 202-452-1940 or email aapinfo@jhu.edu. 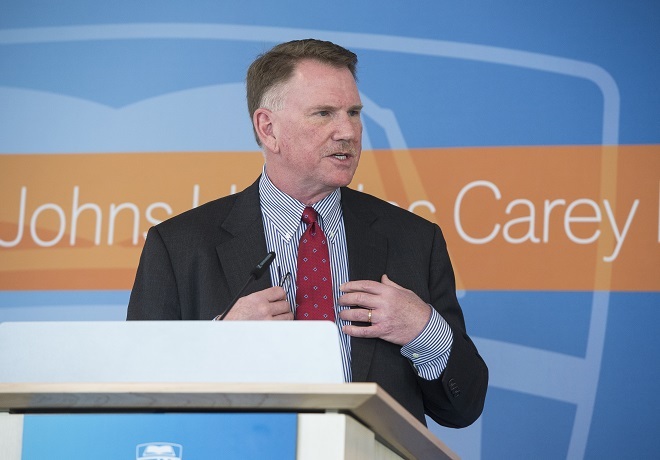 Legg Mason Chairman and CEO Joseph Sullivan visited the Johns Hopkins Carey Business School last week to meet with student, faculty and school leaders.